As I may have mentioned, I’m not one for complex, time-consuming, fiddly cooking. In fact, if I had my way, I’d never make another meal again. The bank balance being what it is, however, neither permanent-guest status nor live-in domestic help appear to be in my future, and as such the evening meal must be slapped on the table one way or another. Night after night after night. Regular readers will recall that my dieting struggles are legendary, even in Hell, as they say. So what I try to do is leverage my aversion to all tasks culinary as a useful weight-loss strategy. Most days, Mr. Slattern arrives home to an exciting supper of grilled fish or chicken accompanied by a large salad, which, through the miracle of ready-washed greens, is as easy to prepare as it is to clean up. Fine. Of course when followed by half a cherry chocolate cheesecake and washed down with a bottle or two of white wine, even the most blameless of meals tends to lose its slimming properties. Still, labor has been saved and vegetables consumed, which counts for something. Manicure intact. Family fed. Is anybody else thirsty? Now, where was I? Oh yes, healthy meals, easy to fix. So the salad meal is great for summer; however, often, as the warm weather wanes, the body yearns for more substantial fare, and a cooked veg can be just the thing. Now I hate screwing around with vegetable prep, I won’t lie. The washing, peeling and chopping wreak havoc with my manicure, and you really do have to be careful when working with knives, which puts an unwelcome damper on the mid-afternoon cocktail hour. 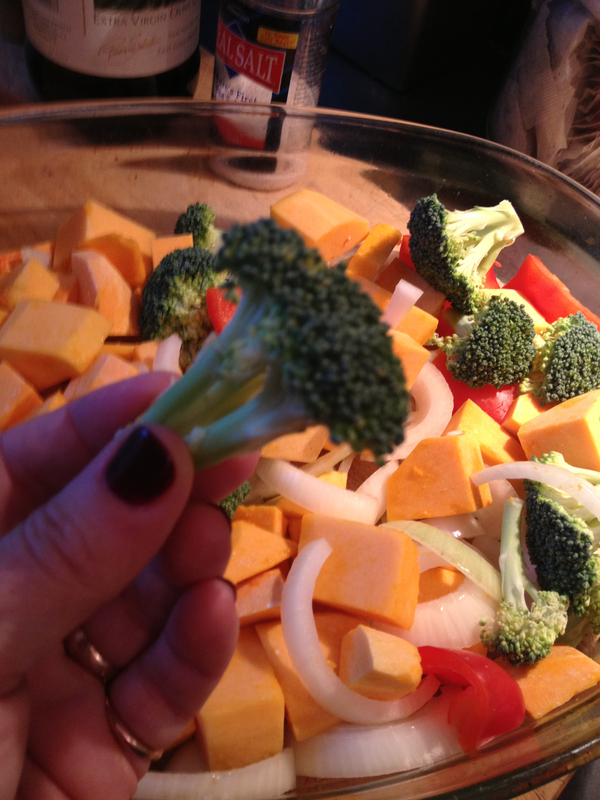 I have, however, partially solved this little dilemma by buying butternut squash and broccoli already cut up. These I mix with a chopped onion, a red pepper and some garlic (all of which have to be prepped, but really it’s not that bad). Just drizzle the whole mess with olive oil, salt and pepper and a couple of pinches of dried oregano, fresh basil or herbes de Provence, pop the pan in a 400 degree oven for half an hour or so, et voila, Lyn Genet’s Italian vegetables as detailed in The Plan, the latest diet I have failed to follow, but which I am certain would have wondrously transformed both my life and my figure had I but been able to choke down flaxseed granola rather than Boston cream donuts at breakfast for more than a week. Roasted and ready. All week long. So anywho, what I do is make enough of this stuff for about forty people and just reheat it in the ‘wave all week or throw it into rice or pasta. If you have higher culinary standards than me — and really, except for Sandra Lee, who doesn’t? — this may not work for you; however, for the sufficiently slatternly this system can really take the sting out of being a hausfrau and put the zing back into sundown…speaking of which, I believe the portable bar is calling my name. 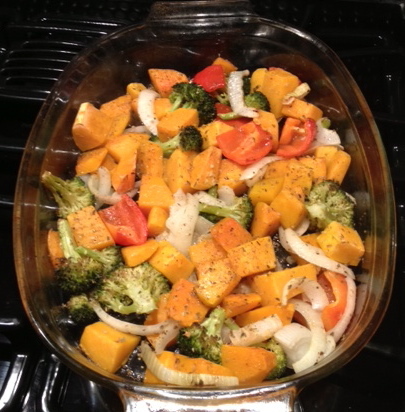 Posted on September 18, 2013, in Dinner, The easy way, UGH Healthy Eating and tagged Butternut squash, chopped onion, cocktail hour, Cook, Herbes de Provence, Home, Italian dressing, Kitchen Slattern, Olive oil, Slattern, The Plan, Vegetable. Bookmark the permalink. 11 Comments. Luckily my standards are just as low and so this suites me perfectly. Low standards mean better success. You heard it here first. Ha! That’s actually my secret to parenting. When you think about it, there’s almost nothing it doesn’t apply to. I’m still waiting for your recipe for lo-cal, delicious-tasting, won’t-wreck-your-liver alcoholic beverage I can drink by the bathtub full. I’m counting on you, Wendie. DARE to dream, but don’t hold your breath. As far as I can tell the only thing that comes close is crack, and we really can’t go there. Can we? KS, as an old kitchen rat I lived through vegetable prep on a grand scale. Now that I’m alone it’s in-season or precut veggies. A lot of corn lately. 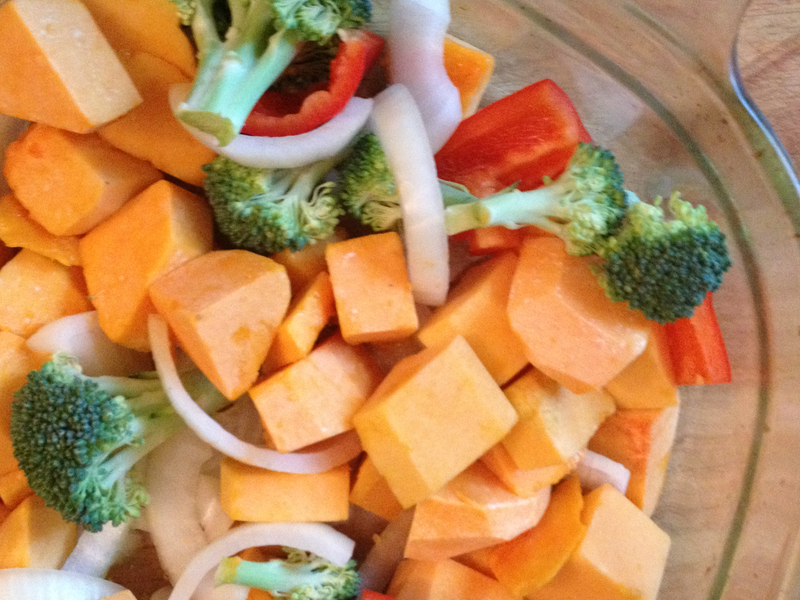 Moving back to preseasoned frozen veggies now that October is rearing its head. If you want and have a food processor I can give you a potato pancake recipe that’s simple and uses maybe four ingredients. Ya if you need it. I’m making Massaged Kale Salad tonight, which sounds much more interesting (and slightly pervy) than regular kale salad. In a small show of rebellion I ate chocolate for lunch. If you can get your family to eat kale, you deserve an all-you-can-eat trip to the Godiva store. I made it. They ate it and liked it. I should buy a cape. Your place in heaven is assured.